I recently sat down with Sean Caspian in the eciov studio to record the inaugural episode of the eciov Gamecast. We’ll still be doing our MunnDay@9 gaming podcast like normal, but I wanted to start doing some Twitch live-streaming and game videos for some of my favorite games. The pair of us could cover hundreds of games, but I’m starting with The Elder Scrolls Online since I’ve been playing it a lot (too often) lately. I will also cover cool games like the Half Life: Update mod that came out recently, Grand Theft Auto 5 (whenever it actually ships on PC), and even some classic games such as Wolfenstein 3D. Be warned, I like pretty things, so newer games will certainly get more attention than the old ones. I’m still playing with the recording gear for this project. For this episode, I was able to upload a beautiful 1080p video at 60 frames per second to YouTube. Ideally, I’d keep it there, but I need to streamline the editing process a bit. I’m looking at alternatives that will allow us to easily stream via Twitch and publish the edited content to YouTube. I’d like to hold regular gaming sessions on Twitch but edit that content down to a YouTube-watchable format. They’re two different markets; I want to cater our content to both audiences. Twitch users are typically okay with a 30+ minute stream, while YouTubers typically get bored and move on after only a few minutes. As for this episode, I spent about 30 minutes showing Sean some of the more advanced game concepts like crafting, bank management, and the add-ons I use regularly. 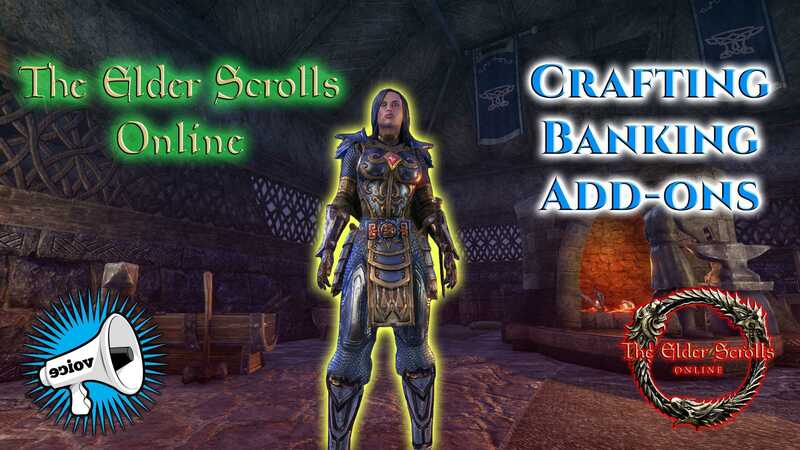 If you’re new to The Elder Scrolls Online, it’s definitely worth watching this video. However, it is possible to enjoy the game without any of this advice… but you’ll be kicking yourself later for missing it. To watch our video content, check out our Twitch channel and our YouTube channel. We’ll be using both for more than just gaming content. In the future, we’ll have all sorts of content on our video channels like product reviews, podcasts, and more — follow/subscribe to both services!